Jennifer Morales is a poet, fiction writer, and performance artist whose work wrestles with questions of gender, identity, complicity, and harm. Raised in the Chicago area, she spent nearly 25 years in Milwaukee. She now lives in rural Wisconsin. Jennifer became the first person in her immediate family to graduate from college when she earned a bachelor’s degree in Modern Languages and Literatures from Beloit College in 1991. After college she moved to Milwaukee, where she raised children and served as an education researcher, a doula, a grantwriter, a Sunday School teacher, and a politician. From 2001-2009 she was an elected member of the Milwaukee Public Schools board, the first Latinx and first out queer person to hold this office in the city’s history. She earned her MFA from the Creative Writing program at Antioch University-Los Angeles in 2011. Jennifer’s first book, Meet Me Halfway (UW Press, 2015), a collection of interconnected short stories about life in hyper-segregated Milwaukee, was the Wisconsin Center for the Book’s 2016 “Book of the Year.” She has short fiction forthcoming in Milwaukee Noir (Akashic, spring 2019) and Cutting Edge: Female Noir, edited by Joyce Carol Oates (Akashic, fall 2019). Recent publications include poems in MAYDAY, Glass Poetry, and Stoneboat. 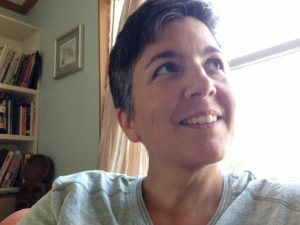 An excerpt of her unpublished novel, Junction, appeared in the spring 2017 issue of the literary journal The Account, and another excerpt appears in Happy Hours: LGBT Voices from the Gay Bars (Flashpoint, 2017), edited by S. Renée Bess and Lee Lynch.